This persuasive speech makes some great points in favor of students' having to wear school uniforms. See if you can come up with even more arguments in favor of this idea - or how about a whole new speech arguing against the idea of mandatory school uniforms? Make sure you start with a good speech outline outline in order to make it easier to keep track of any points you want to include in your speech. Check out these tips on writing a persuasive speech as well. They'll help you to create a great speech that might actually convince your audience to come around to your way of thinking! Should students be required to wear a uniform to school? That is the question that has been raised for discussion here today. Private schools have long been known for having school uniform policies. Now some public schools such as ours are deciding whether or not they want their students to wear a school uniform. Some people argue that requiring students to dress a certain way takes away their sense of creativity and individuality. However, there are several strong arguments in favor of schools requiring school uniforms. Wearing a school uniform can encourage some students to take their responsibilities more seriously. If they wear the same clothes to school that they wear when they go to the mall with their friends, they may have the same laid back attitude in both places. Wearing "work clothes" to school can change the students' frame of mind and inspire a more serious attitude that is focused on study. School uniforms can also lessen the negative effects of class status. In some schools you are only popular if you wear the latest fashions and trends. Students are sometimes left out or even teased if they are unable or unwilling to pay to dress the way the popular students are dressing. Requiring students to wear a school uniform levels the playing field, by reducing the implied class status that is created when only certain students can buy the most expensive clothes. Not only is teasing decreased, but violence can also be prevented at schools that have a required uniform. Gang violence is becoming more prevalent at schools around the country. Sometimes fights can start over someone wearing the "wrong color" or gang symbol. There have even been instances of gang members sneaking into schools to recruit or harass students. Required school uniforms can reduce fighting among students and prevent outsiders from being able to get into the school undetected. Some opponents of school uniforms worry about the cost, but uniforms can actually cost less than other school clothes. With regular clothes you usually buy a different outfit for each day of the week. You may even buy more than that. With a school uniform you can just purchase a few items, as you don't have to worry about wearing something different each day. You can also pass school uniforms down to family members, or find them on sale from other families. There is a lot of controversy over whether or not school uniforms should be required. However, when you look at the facts you will see that there are many benefits to students all wearing the same thing to school. Students may take school more seriously, teasing and violence can be decreased, and you may even save some money. Please keep these benefits in mind when you vote today! 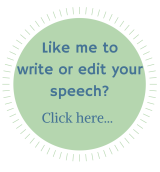 I hope this persuasive speech has helped you to formulate some ideas on your chosen speech topic. Make sure you believe in the subject you have chosen to present to the audience and try to put yourself in the shoes of your listeners, thinking up any counter-arguments they may have, and addressing them! Use the right words and you'll find that persuading folks to think differently about your chosen topic is not as difficult as you may have thought it would be.